With pet owners becoming increasingly concerned with the quality of their pet’s food and treats, the gourmet pet bakery industry is expanding rapidly. The first step is to form your business as a sole proprietorship, partnership, limited liability company (LLC), or corporation. There are various tax and liability advantages to each type of business, so it is wise to consult with your accountant or attorney to determine which option will best suit your bakery operation. Next, you have to determine whether you will operate out of your home or a retail location. If you operate from home, you can sell products online via a website and use PayPal or a merchant account to accept credit card payments. This is a lower cost start up option than a retail store if local regulations permit it. A retail store offers additional exposure and customer traffic, but will obviously involve added costs for rent. You may also need to apply for licenses or permits, comply with health codes and inspections, and check for additional requirements with your county, city, and state regulatory agencies. An additional consideration for a pet bakery business is obtaining an insurance policy. Dog bakery supplies can be purchased from a number of suppliers such as K9 Cakery. A wide variety of cookie cutters, cake pans, and containers are available. Once your business is established, you may wish to have customized packaging developed. The most attractive feature of a gourmet product is the fact that it is an all-natural and additive free option, as opposed to chemically preserved and mass produced products that are commonly stocked in pet stores. This advantage should be heavily emphasized in your marketing and printed on your packaging. It is important to note that in many states it is recommended (or even required) that you have your ingredients analyzed and listed on the packaging. Each product should have a catchy or descriptive name. Holiday-themed treats are always popular with pet owners. Themed treats can be designed to celebrate Christmas, Halloween, Easter, New Year’s Eve, St. Patrick’s Day, Valentine’s Day, or any number of occasions including birthdays. Some dog bakeries offer a catering service for pet parties. Gift baskets are a great way to present products. The basket can be in the shape of a dog bone, or placed in a thematic container such as a Christmas stocking or Easter basket. Animal paw print cellophane bags and ribbons can complete the look. Once of the most important factors in making your business successful is to distinguish it from the competition. You need to develop a creative, unique name and logo that potential customers will remember. There are many great advertising options for a pet bakery business. You can send out flyers, catalogs, and postcards. You can leave these items, along with a business card, at various pet-related locations such as dog parks, pet stores, and veterinary clinics. You can place large magnets on your side and rear car doors. If you have a website, be sure to allow customers to subscribe to your mailing list for a weekly or monthly newsletter featuring special offers, events, and coupons. Gourmet pet products are often sold through trade shows, gift shops, dog shows, craft fairs, pet stores, and veterinary clinics. You can approach veterinarians, dog trainers, dog walkers, doggie daycare owners, and dog groomers about offering your products. You can donate gift baskets to fundraisers, featuring your business card and logo, to gain exposure while helping a good cause. You could also set up a product sampling event at a fair or pet store. Word of mouth will be a major factor as your business becomes more established. One happy customer can refer dozens of new clients. The best way to figure out your product pricing is to research similar products produced by other local or online pet gourmet businesses. Your prices should fall into a similar range. You should also factor in the costs of the ingredients necessary to produce a particular item. Gift items, such as gift baskets, usually carry a premium price. Be sure to carefully design an order form. The form should clearly outline your refund and deposit policy. Nearly all pet bakery businesses accept some sort of credit card payment system. You will need to ship for quick delivery via FedEx, UPS, or USPS Priority. It is best to mark the packages “perishable.” Package your items in shrink wrap and vacuum seal to ensure freshness and prevent mold. The U.S. pet industry commanded $50.84 billion dollars in 2011, according to the American Pet Product Manufacturers Association. Pet food items command $19.53 billion of that amount. The APPMA estimates that there are 78.2 million dogs and 86.4 million cats kept as pets, and that number is expected to increase each year. 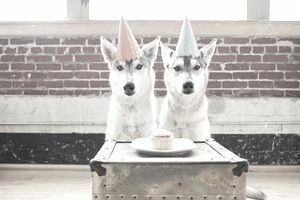 Pet bakery businesses should expect to have positive momentum as the number of pets and pet expenditures continue to grow.